Remember I make this for the huge pot in the picture. You probably will need to scale this back if you use a smaller pot. A couple notes worth mentioning. I prefer a thicker, chunky sauce. If you like it thinner or a heavier ratio of sauce to veggies and meat — adjust accordingly. All of the spice and seasoning measurements are my best guesses. I always start with approximately these amounts and then season to taste. I’m pretty sure I’ve never made the exact same sauce twice. Brown the sausage and ground beef and strain off the excess grease (I mix the two because I don’t like the sauce to be too spicy.) I’m guessing many of you would be fine with using all Italian sausage and skip the ground beef so experiment. Combine the tomato paste, water, butter, and all of the spices/seasons into a big pot and stir it until everything is well mixed. 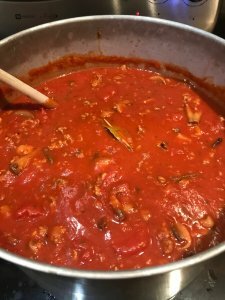 Turn on a medium heat and once the sauce is pure liquid — add the meat, tomatoes (including the “juice” in the can) and mushrooms (strain them first). Before you add the whole tomatoes, cut each tomato in half or at least open them up so they don’t stay whole as you cook the sauce. I am sure there’s a cooking term for this…but I want chunks of tomato, not whole tomatoes (bigger than diced which is why I use the whole tomatoes) in the sauce. 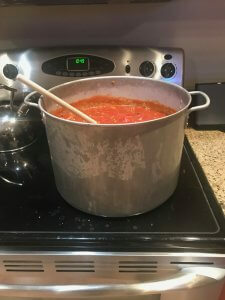 Cook the sauce for a couple hours on a medium heat, stirring regularly (I set the timer for 10 minutes and just keep resetting it after each stirring). Then, taste it and add seasoning accordingly. By then, the ingredients will have all worked their way through the sauce and you’ll have a good sense of the base flavor. Then simmer it for about three to five hours before you taste and tinker again. Stirring consistently is critical. If it burns on the bottom of the pot — it ruins the whole batch. I reduce the heat to low…and leave it on the stove for a couple days. Before you serve — pull out the bay leaves (they do not taste good if you miss one). If you want to get fancy — you can add zucchini, red wine, peppers, onions, roasted garlic, etc. I never add any of that…but I’m a simple creature!